Regiment/Catrawd: Denbighshire Yeomanry and The South Wales Borderers. Killed in action, 10th April 1918, age 19. Ivor Dryhurst Jones was the son of Reverend William Jones, and his wife, Mary Ellen. He was born at Llanfair Caereinion, Montgomery, and his birth was registered in the third quarter of 1898 at Llanfyllin. He was the brother of Arthur Saunders Jones, who has his own page on this website. In the 1891 Census for Wales, available on Ancestry, the family are living at Church Street, Northop, Flintshire. Head of the family was William Jones, age 32, born at Bettws in Carmarthenshire, and described as curate of Northop. Mary Ellen was 28, born at Amlwch, Anglesey. The children were William A, age 3, Frances S S, age 2,and Marian E H, age 2 months, all born at Northop .There was also a domestic servant, and a nurse. By 1901, they were living at Llanfair Caereinion, in the Vicarage. William was now the Vicar, and was described as a clergyman in the Church of England. William and Mary Ellen spoke both Welsh and English. The children Marian E age 10, Rose E age 9, Catherine M age 8 , Mary age 6,and Enid age 4, had all been born at Northop, while Ivor D age 2, Arthur age 1, and Alice G 7 months, had been born at Llanfair Caereinion. There was also a housekeeper, a nurse, and a housemaid. While all the adults spoke both languages, the children spoke only English. In the 1901 census for England however, the eldest son, William Alcuin, baptised 16th May 1887 at Northop, can be found as a schoolboy at St Mary and St Nicholas Foundation School, Leatherhead, Surrey. The school was founded for educating, free of charge for a period of years, the sons of poor clergy of the Church of England. By 1911, the family circumstances have changed. Mrs Mary Ellen Jones is now a widow, age 49, and they are living at Gorphwysfa, Prestatyn. Four of the girls were still at home, while since the last census, Basil age 9 had been born at Llanfair Caereinion. There were also three servants. Mary Ellen had given birth to 12 children, of whom 11 were living. The two boys Ivor and Arthur, who would by now be about 11 and 12 years old, were not at the family home, and could not be found on the census. It is more than likely that they were away at school, as their elder brother had been at their ages. Ivor’s service records have not survived, and the website Soldiers who Died in the Great War confirms the known details. We know he was in the 5th Pioneer Battalion, the South Wales Borderers. The 5th (service) battalion was formed in September 1914 under Colonel CV Thrower, and under his leadership reached a high standard of discipline and efficiency. On 16th July 1915 the battalion landed in France, in the 38th brigade of the 19th division. It soon became the divisional Pioneer battalion, and during the Battle of the Somme, lost 220 men in the last ten days of July alone. Ivor’s commission in the South Wales Borderers is reported in the Supplement to the London Gazette of September 28th1917. Word was received on Wednesday of the death in action of 2/Lt Ivor D Jones, SW Borderers (Pioneers). He was but 19 years of age, and the 3rd son of Mrs Jones, Gorphwysfa. 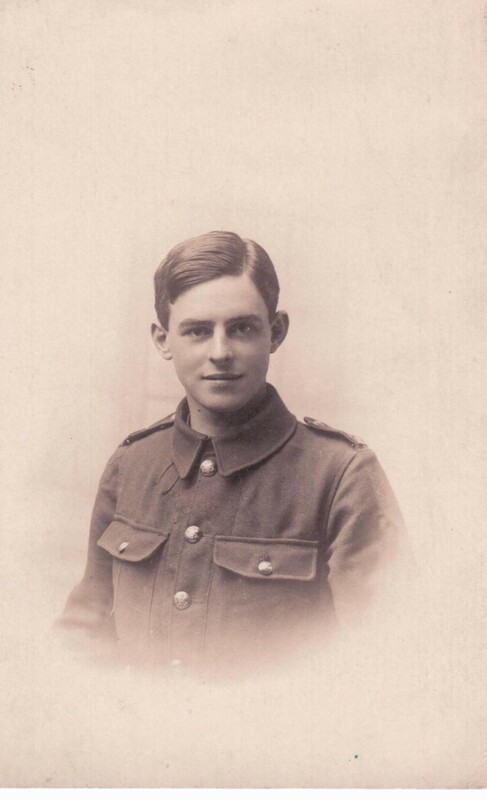 He joined the Forces when he was 17 ½ years old, and since receiving his commission had been 7 months in France. From the website On this Day WW1, On April 10th 1918, the day Ivor was killed, it states that the 5th S W Borderers were fighting north of Armentieres. The line of battle faced back to Wytschaete, Messines Ridge, and Ploegstreert. The next day, during the action in the area of Wyschaete and Messines Road, they lost 13 men. It was on this very day that Field Marshall Haig issued his “backs to the wall” special order. Ivor is commemorated in the Roll of Honour for the South Wales Borderers who died in 1918. It states that on 10th April Lieutenant I.D. Jones was killed in action in Belgium, west of Wyschaete (location), note 407. The note refers to the page in the history of the South Wales Borderers where his death is mentioned. He is also commemorated on the website Sons and Daughters of the Anglican Clergy throughout the world, and of the Naval and Military Chaplains of the same, who gave their lives during the Great War 1914-1918. Another commemoration is in the website Boy Soldiers killed in Belgium by Paul Fosla. 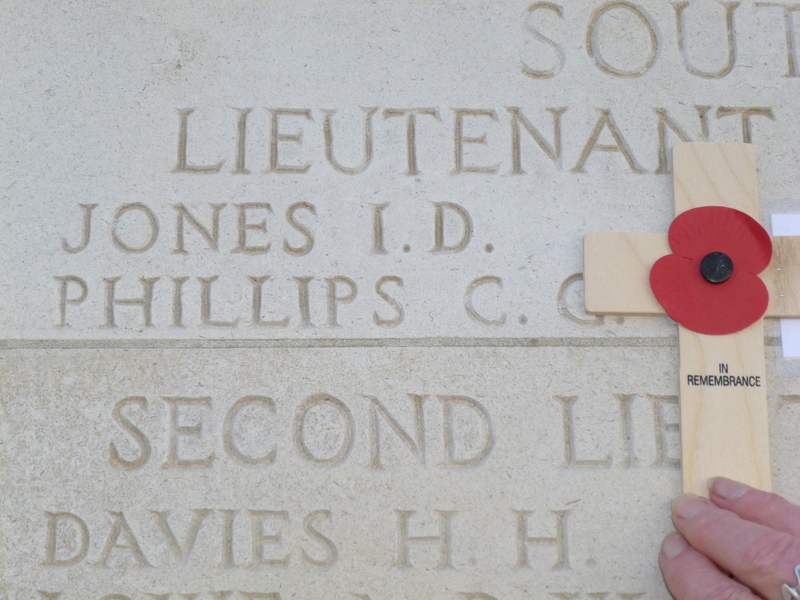 Captain the Reverend W A Jones, son of Mrs Jones Gorphwysfa, has been awarded the Military Cross for services rendered. In the Supplement to the London Gazette, April 22nd 1918there is more information. For conspicuous gallantry and devotion to duty. During the capture of a hill he volunteered to take charge of the stretcher bearers and throughout the day attended to and dressed the wounds in the open under heavy machine gun and rifle fire, assisting on several occasions to carry stretchers himself. He displayed marked gallantry and contempt of danger. After the War he became Vicar of Llangollen. His son, Ivor Alcuin Jones, no doubt called after his younger brother,was a Flight Lieutenant in WW2, and died after a flying accident in 1944, and is buried in St John’s Churchyard, Llangollen. Photo of Ivor courtesy of Elizabeth Ann.